Maybe you have professional web developers on your staff – and if so, that’s great! But chances are you don’t, and why should you? 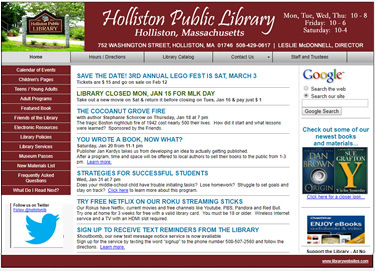 Small and mid-size public libraries typically don’t have the time or the budget to focus on the technical details of website management. With PiperWebs and librarywebsites.com, you don’t have to. All you have to do is manage your site content, and our system makes that task as easy as using a word processor. If you do run into questions, or just want to talk about new options or features for your site, we’re always just a phone call away. We work exclusively with public libraries. This means that we may already be familiar with many of the systems and providers that you use. We’ll bring our experience with other libraries and library website best practices to the table – to help you develop an outstanding site for you and your patrons. With PiperWebs, you don’t NEED web development experience on your staff . You have us!